Cottage in Cabourg 300 meters from the beach, on a garden & a quiet park. Property 18: Cottage in Cabourg 300 meters from the beach, on a garden & a quiet park. Renovated house 2018 at 120m from the beach; rental by the week on Saturday. Property 21: Renovated house 2018 at 120m from the beach; rental by the week on Saturday. oceanfront house near downtown and Cabourg. Property 31: oceanfront house near downtown and Cabourg. Character house in a farmhouse. Property 34: Character house in a farmhouse. 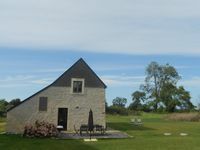 A delightful one bedroom cottage with stunning views of the French countryside. Property 39: A delightful one bedroom cottage with stunning views of the French countryside. Veronique and Jerome were very welcoming and extremely helpful. Jerome graciously provided transportation to the nearby Carrefour since we were without a car. We used the house as a base from which we had organized guided tours pick us up. The house was spotless and well maintained. We were able to eat a simple breakfast before departing for our tours each day. We returned to cook dinner each evening. The kitchen although not huge is adequate and had plenty of pots, pans, utensils to prepare main dishes. One drawback is the very steep stairs to the second floor&mdash;a concern for young children and older adults. However, there is a downstairs bedroom and bathroom/shower so no worries. On Easter Sunday, Jerome surprised us bright and early with fresh pastries which was very much appreciated. Thank you! Loved the house and location. Very spacious and comfortable. George was great.